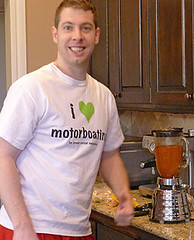 Our Guest Chef today is our good friend, Shawn, whom we met through his wonderful wife, Stephanie, 12 years ago! They have since moved back to their home state of Oklahoma, and we miss them and their two ‘nuggets’ dearly! Shawn made these tacos for us two years ago, and more recently on our latest visit. 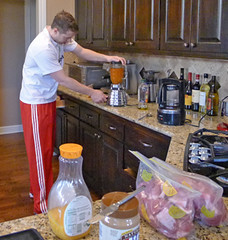 That’s him in the photos below, bright and early in the morning, getting the marinade for the meat ready. Yes, he really gets into it! Thank you Shawn for sharing this mouth-watering recipe! 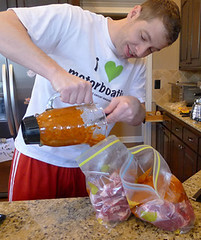 We put ours in ziploc bags and really massaged the marinade into the meat. Let it marinate over-night or a minimum of six hours if possible.Fire up your grill, preferably wood charcoal! 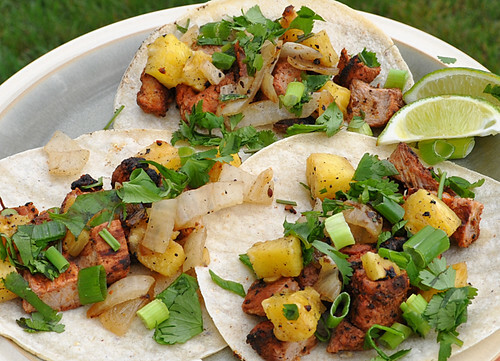 Once these have gotten slightly charred with some wonderful grill marks, pass them off to your kitchen apprentice so that they may dice them into small pieces while you go ahead and grill your pork to succulent perfection.Dice pork once it’s through and combine all three ingredients: Pork, Pineapple and Onions. We all got a good chuckle out of it too. Especially since I thought it was some sort of water sport. Apparently the T-shirt was for a breast cancer awareness event. Shawn’s Tacos are really terrific,very tropical and just the right amount of spice. Thanks Mary for featuring them. I made these yesterday and they were amazing! My entire family inhaled them. I was a bit concerned about the amount of chipotles, but the heat level was fine and the taste was fabulous. Thanks for such a great recipe!